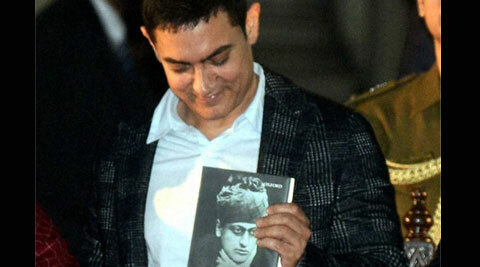 'Just do what your heart says' was the message Maulana Azad had given to Aamir Khan's uncle Naseer Khan. ‘Just do what your heart says’ was the message Maulana Azad had given to Aamir Khan’s uncle Naseer Khan. Claiming that the message of his iconic film ‘3 Idiots’ was the same as given by Maulana Abul Kalam Azad, actor Aamir Khan today said it was his dream to make a film on the life his great grand uncle. ‘Just do what your heart says’ was the message Azad had given to his uncle and director Naseer Khan when he wanted to make films, Aamir said after inauguration of the Apeejay Kolkata Literary Festival here. “Ironically this was the message of my film ‘3 Idiots’,” the actor-director said, recalling that had Naseer not got support from Azad, he would never have been in the film industry. ‘Maulana Azad: His belief in secularism and his foresight’ to mark his 125th birth anniversary. “I hope that some day I will be able to use my art to make a film on his life. It is my dream to do that,” Khan said. “I wish I had met him, known him. I have read his books drinking in every word,” he said, adding that Azad had an extremely progressive and fertile mind. He had very high intelligence, integrity, high values and justice was at the core of what he did, said Aamir Khan whose grandmother was the niece of Azad, India’s first education minister. To explain how Azad’s ability to predict what would happen after India’s partition, the actor read out an interview which was given in 1946. “Almost everything has come out to be true,” said the actor, who played the bad guy in the recently-released action film ‘Dhoom: 3’. Sitaram Sharma, chairman of Maulana Abul Kalam Azad Institute of Asian Studies, said that full support would be given to the actor-producer for his film. West Bengal Governor M K Narayanan, who was present at the inauguration, said he had the privilege to have met Azad personally when he started his career as a civil servant. “I score over Aamir Khan as he wasn’t even born at that time,” Narayanan said.